TSCNick, thanks for taking the time, I know you’re mad busy at the moment. First off, what was it like taking the leap from editing to writing a novel? Did you get any helpful tips along the way from fellow BL legends? Nick Well, I was actually writing novels (and short stories) before I started editing. As well as a slew of shorts in Inferno! (TSC -Ahh those were the days…) I also wrote a Necromunda novel, Back from the Dead, before I started at BL. I would say that Christian Dunn was a tremendous support for me in those early days and I’ll always be very thankful to him for giving me an opportunity. Can’t say I knew many BL legends back then; at least none that I could talk to. I was certainly inspired by the likes of Dan Abnett and William King, however. TSC Dan is a top chap. He’s certainly been very supportive/tolerant of this blog. Before I get down to talking about the Marines in Green; You wrote Fall of Damnos, part of the Space Marine Battles series, and the Assault on Black Reach novella. What was it like taking the helm on a chapter that had, up to that point, only been written about by Graham McNeill? Nick A real nice change of pace to be honest. I actually did Assault on Black Reach before Salamander, so you could say I started with the Ultramarines. Graham was awesome as well, seeing it only as a good thing that another author was tackling the same Chapter, but a different character. His work on the Ultramarines is tremendous and served as a real inspiration for me, even though I was determined to put my own stamp on the Chapter. TSC It’s Graham’s fault I have two companies of Ultramarines! Nick Getting to write Fall of Damnos a little later was great as I’d had the experience of writing a full 40K novel by then and would be afforded the opportunity to explore the characters from Assault on Black Reach. TSC I think it’s fair to say that you have a fondness for the Salamanders Chapter. What drew you to them in the first place? Nick The fact that no other author had written about them was attractive. It allowed me to do a lot with them in terms of the Chapter itself, their homeworld, beliefs etc. I definitely found the dichotomy of their monstrous appearance and ostensible humanitarianism very interesting. The forging rites, Nocturne itself and their history during the Horus Heresy was also extremely compelling for me. TSC I never really gave them much thought until you came along. Now they competing with the Raven Guard for my second favourite Chapter. For those that haven’t read the Tome of Fire trilogy, tell us a little bit about the plot and how you went about the process of constructing the trilogy. Nick The story centres on a sergeant called Dak’ir, who is unusual because he’s the only Salamander to have ever been recruited from the subterranean slums of Ignea, a region on Nocturne. His nemesis within the Chapter is Tsu’gan, a volatile but heroic sergeant who hails from Hesiod, one of the sanctuary cities, and is at the polar opposite of the class scale compared to Dak’ir. The two are thrust together in Third Company, a very uneasy pairing that gets tougher following the death of their captain, Kadai, for which Tsu’gan blames Dak’ir (though, secretly, he blames himself). Matters are complicated further when it becomes clear that Dak’ir could be the focus of a prophecy foretelling the doom of Nocturne and the Salamanders, a prophecy that goes back to when Primarch Vulkan still walked the earth. 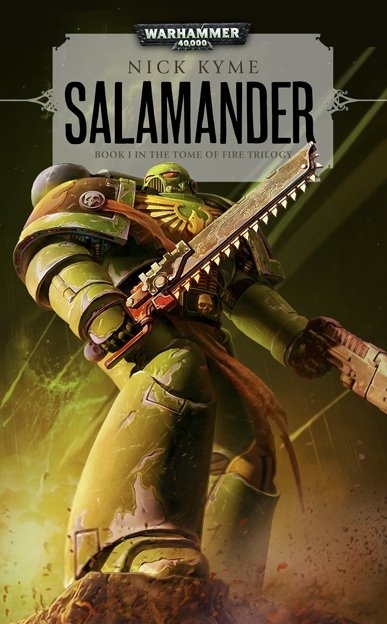 Across the three volumes the Salamanders are pitted against the likes of orks, dark eldar and the Chaos Space Marine renegade Dragon Warriors, some of whom, including their leader, Nihilan, used to be Salamanders. The Dragon Warriors have sworn an oath to destroy the Salamanders and were the ones responsible for the death of Kadai. Slowly, as the story unfolds, Dak’ir evolves into a powerful psyker and starts to realise his potential as the saviour or destroyer of Nocturne and Tsu’gan, despite becoming one of the vaunted Firedrakes, descends further into a place of darkness from which there may be no return or redemption. It’s an epic story and includes a vast supporting cast including Tu’Shan and Vulkan He’stan. The three books: Salamander, Firedrake and Nocturne are very much parts of one large whole and supported by a host of short stories that will be released together in the ‘fourth’ book in the trilogy, Tome of Fire in which there will be a brand new novella that goes back in time to when Kadai was still alive and how Nihilan strayed to the path of Chaos and created the Dragon Warriors. Nick I always intended it to be a trilogy, the story line is fashioned in that way and although it has elements of self-containment was always intended to be read as three books. One of the biggest surprises for me was the evolution of Tsu’gan and his popular appeal. In the beginning he was only intended as an antagonist, someone to measure Dak’ir against but he became so much more, demanding more page time and story lines for himself. Dak’ir was always supposed to be the solo star and Tsu’gan went and pinched a load of the limelight, which I’m actually pretty happy about. I love telling both their stories. Their arc is an interesting one in that in Salamander you get to really see the needle between them, but in Firedrake they’re off chasing their separate destinies so there’s not the same back and forth. By the time Nocturne comes around they are thrust together again but on very different sides and actually quite changed as characters. TSC As you say, it’s an epic trilogy and required 40K reading. As is Promethean Sun, the Horus Heresy novella. This was a game changer in terms of the relationship the Emperor had with his sons. Was this revelation planned or did the Black Library just green light your ideas as it was quite a bold move. And how much guidance did you get along the way? 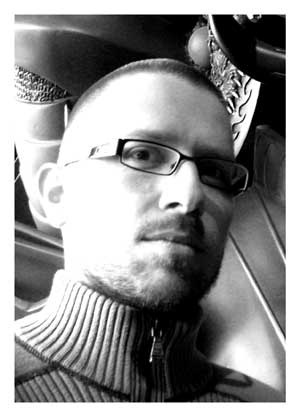 Nick I was originally intending to write a 40K Salamanders novella (likely the Dragon Warriors origin tale I mentioned earlier) when my editor, Christian Dunn, asked if I would like to write something from the Horus Heresy era. Naturally, I jumped at the opportunity and, of course, Salamanders was what I wanted to write about. Yes, BL did greenlight my ideas regards Vulkan and the Emperor but that process is the same for anyting any author writes. Although the story is ostensibly focused on the Great Crusade I wanted to do something that also had a little resonance for the greater Heresy to come, focusing on the relationship between Vulkan and his father seemed like the best way to do that. Fellow author Graham McNeill was a great source of support and guidance throughout the project as was my editor. It’s important as a writer to garner as much opnion from trusted and objective sources as you can. I was really pleased with the way Promethean Sun turned out and I look forward to next year when it will come out as a non limited edition novella so that more fans can read and enjoy it. TSC Fans are going to be pleased a standard version is on the way for, it’s an outstanding book. I must admit I did get a limited copy. Number 12 in fact. But anyway, Primarchs, the Horus Heresy anthology is out later this year and I believe you have a story in there about Ferrus Manus, who I’ve always seen as quite a tortured souls despite outward appearances. What can you tell us the story and his development as a character? Nick The story sort of dovetails with Promethean Sun in that it’s the same theatre of war, but totally stands by itself. Ferrus Manus and the Iron Hands are fighting eldar during a difficult compliance and during the course of the campaign Ferrus becomes separated from the Legion. From there he goes on a strange sort of odyssey where he’s forced to confront spectres of the future, his future and make a very difficult decision about his path. It’s a sort of a ‘what if’ story in some ways and throws some light on the importance attached to the choices that awesome beings like the primarchs make, and the resonance that can have afterwards. A little like with Promethean Sun I wanted to tell a story that had meaning and echoed forwards into what was to come in the series, dangling threads that are dragged on the current of the story line and aim towards the unwritten future. TSC That sounds fantastic. Following on from that you have a novella in the pipeline called Scorched Earth that will have a follow on novel. What can you tell us about it so far, without giving too much away? NickThe novella is set on Istvaan V, specifically in the aftermath of the Dropsite Massacre and focuses on a bunch of loyalist survivors that tried to escape the carnage but failed. They’re being hunted as remnants of the, now, Traitor Legions seek to wipe everything and everyone out who is still loyal to the Emperor. In particular, two Salamanders are trying to find Vulkan; his ship, his body anything, and have to cross some extremely dangerous territory to do so. I won’t tell you what they find but it will have the Horus Heresy boffins speculating until froth comes out of their mouths. As for the novel, that’s strictly hush-hush I’m afraid. TSC You tease! You’ve also got an Emperor’s Children audio drama coming out in October, how do you find writing an audio script compared to writing a novel? With audio you need to think about the fact that it’s going to be listened to and not read (at least not until we print the script or a prose version of the story). It’s important not to have too many speaking characters as the audio dramas tend to be a small cast. There should also be plenty of action and dialogue, and light on the narration. When writing a script you need to consider scene changes and the atmosphere that should be evoked during that scene, any and all sound effects, the tone of voices and excising words like ‘said’ or anything that attributes a quality to speech – you don’t need it; the actor will provide, you just need to give them some guidance as to how you want something said/expressed. I actually wrote the short story in prose first and then converted it into a script. I prefer to work this way as prose writing is something I’m more familiar with. I can gauge the pacing and tone a little easier. It takes about another day to work up the script from that, which is generally separating out the dialogue, excising unecessary narration and adding scene changes, atmosphere and sound effect instructions. It’s a very interesting intellectual exercise. TSC The end results speak for themselves, I live the BL audio dramas. Finally, because I ask all the writers I interview, what advice would you give to budding writers eager to follow in your footsteps? Nick The same advice I give to anyone who asks me that question: read widely and write a lot. Get feedback from as many objective readers as you can. Pick friends if you like, but only if you want an ego massage; the best advice comes from people who don’t have any stake in you at all – they’ll give you the hard truth and you’ll grow because of it. If you are/want to be a writer, do it everyday and try to enjoy it. Find your own voice, although there’s nothing wrong with emulating your favourite authors until you do. Finally, develop a thick skin. Unless you’re really lucky, you’ll get rejected. A lot. Don’t take it too harshly. Try and get feedback and anaylse what you can do differently/better next time. Don’t think you know it all. You don’t, and never will. As a writer you should be learning and developing all the time. If you think you’re not/can’t then it’s time to hang up your laptop and take up martial arts or something. TSC Good advice. Nick it’s been a delight, thank you again and good luck with all the projects.